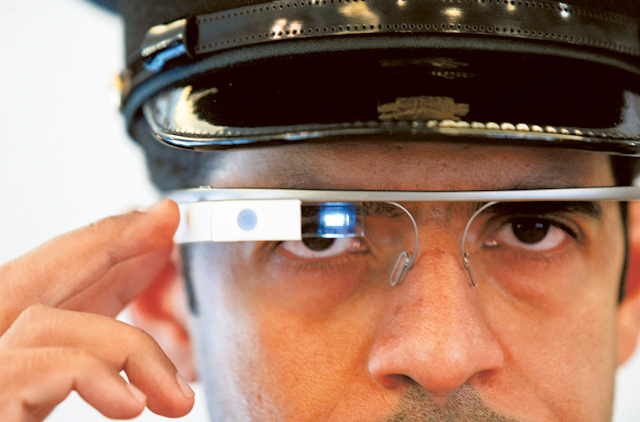 Dubai: Dubai Police will soon use Google Glass to issue fines to errant motorists as well as identify wanted cars, said a senior police official. The smart eyewear is currently under trial by Dubai Police Smart Services Department, for use by traffic police. Google Glass is a small computer mounted onto glasses. It can take photos, record video, access the internet and give directions among other uses. It is compatible with both Android and iOS. According to Google, It has a high-resolution display that is the equivalent of a 63.5cm high-definition screen from 2.4 metres away. The glasses feature a 5 megapixel camera. Colonel Khalid Nasser Al Razooqi, General Director of Smart Services at Dubai Police, gave Gulf News a demonstration of how Google Glass would be used by the force. Taking photos using Dubai Police’s Google Glass’ program is simple. The officer just needs to tap the side of the glass and the photo, in addition to the exact location, time and date is automatically sent to the system. As for determining whether a car is wanted or not, Col Al Razooqi said that all the officer needs to do is look at number plates and the Glass will cross-reference the plates with the traffic department’s wanted vehicles database and alert him if any vehicle is wanted. Both programs were developed by an in-house team from the Dubai Police smart services. “We at Dubai Police always try to adopt what is new in the market and we like to stay up-to-date,” Col Al Razooqi said. He said that Lieutenant General Dahi Khalfan Tamim, Deputy Chairman of Police and General Security in Dubai, and Major General Khamis Mattar Al Mazeina, Dubai Police Chief, always encourage them to find and provide the latest technologies in the world, as well as find ways to make the public interact with Dubai Police. The Glass Explorer Programme, which allowed some people to be among the first to experience and test this new technology, was launched a year ago.